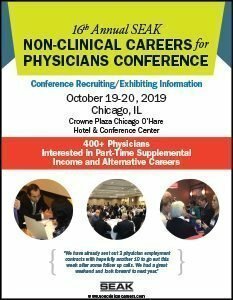 Non-Clinical Employers, Recruiters and Vendors - SEAK, Inc.
At our recent conference, we had 400+ physician attendees along with recruiters looking to fill 100+ non-clinical positions. Our recruiters and employers conduct hundreds of interviews onsite and hire many of our physician attendees. SEAK’s Non-Clinical Careers Conference is the perfect venue for anyone who is looking to recruit or network with motivated physicians who are looking to try something new. SEAK, Inc. (www.seak.com), founded in 1980, is an ACCME accredited continuing education, consulting and publishing firm. We have trained thousands of physicians across the United States. Who is the typical conference attendee? The vast majority of our attendees are board certified and currently practicing medicine. They come from across the country to attend the conference. How many attendees do you usually have? We expect to have 400+ physicians at the conference in many different specialty areas. Why are Doctors coming to the conference? Why should I come to recruit at the conference? The cost is $2,195 which covers 2-days of exhibiting/recruiting, for a 6-foot table, and 2 representatives. Note that exhibitor representatives are not allowed in the program sessions. The conference is held at the Crowne Plaza Chicago O’hare in Rosemont approximately 3 miles from the airport. Rosemont is a fast growing conference area with many restaurants and a complimentary shuttle to the airport. What should recruiters bring to the event? Recruiters & vendors should bring 400+ handouts with your company information, job descriptions, business cards, etc. Are there set exhibiting hours? Exhibiting is done throughout the 2 day conference. There are no set exhibiting hours, the attendees enter into the exhibit hall to speak with recruiters throughout the conference. Do the attendees bring their CVs with them? Yes, many of them do. Are exhibitors provided with a list of attendees? “I placed two of the doc’s from last Conference in Medical Director roles in December and may have current openings for a couple more. Both physicians are very happy with their new management roles.